ICD-10 Translation: Is There Too Much to Lose? Translation to ICD-10 from existing hospital codes presents a challenge for coders in avoiding error. With such a large difference in total codes (68,000 ICD-10 codes versus 13,000 ICD-9 codes) a smooth transition will prove tedious. Are there going to be significant financial and clinical repercussions from too many mistranslations? 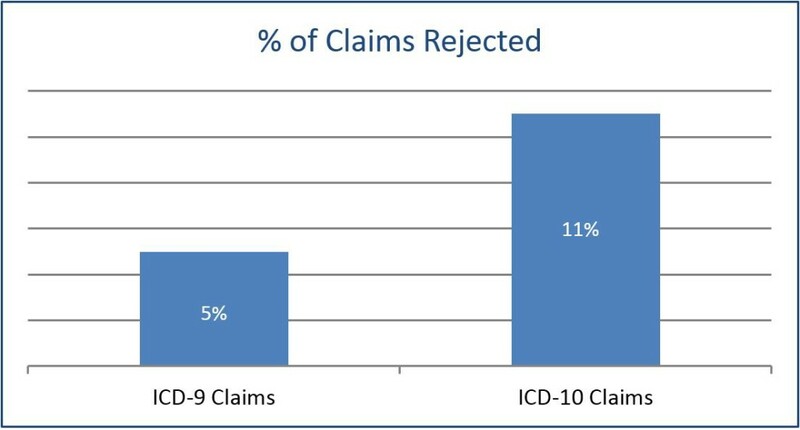 In a study conducted by CMS, approximately 2,600 participating providers submitted more than 127,000 claims using ICD-10 codes to the Medicare Fee-For-Service claims system. National results were mixed, with CMS rejecting 11% of the ICD-10 claims on average; lower than the current average of 2% to 5% with ICD-9. Is this statistical difference significant? Researchers at the University of Illinois took ICD-9 codes used in hospitals and analyzed their translations to ICD-10. From their findings researchers concluded that 26% of the translations were convoluted, resulting in an 8% risk of losing clinical and financial information. Typically, pediatric facilities function on an error margin in which 3% to 5% of codes resulting in billing error could have a significant financial impact. In a press release from HRAA CEO Andrea Clark, “HIM coders must be exposed and then trained on the fundamentals of ICD-10 to ensure that a hospital’s revenue system remains intact and that millions will not be left on the table when the transition takes place”.Taking from test results, equipping coders with tools to translate from ICD-9 to ICD-10 will decrease coding errors in hospitals. With the proper coding personnel, ICD-10 should increase the efficiency of medical services and work towards preventing communication errors across the medical field. The key, it seems, is in hiring and training coders with the proper skillset. Higher skills, equal better coding. Better coding means less error. Less error will mean more cost-effective operations by the hospital, and ultimately, a higher quality of care for the patient.